This is a sponsored post on behalf of The National Milk Life Campaign’s Back-to-School program. As always, all opinions are 100% mine. We have a big, busy family. The 3 little boys (who are 1 1/2, 2 1/2, and 3 1/2) are just plain busy little people, always moving and full of energy. The big kids are almost 10 and 11 1/2 and are involved in EVERYTHING – soccer Tuesday & Thursday, Cross Country Monday, Wednesday, Friday, and some Saturdays. In addition to sports they have band obligations, student council commitments, homework, and social lives. My husband and I have a bakery business supplying baked goods to a local coffee shop several days a week and baking special occasion cakes most weekends. Plus I love to write for the blog and stay in touch with our wonderful readers. I’m exhausted just typing about how busy we are! It’s hard to make extra time for things when our schedule is so busy but one thing we always make sure to make time for is quality family time. How do we do this? These are my Tips for Quality Family Time with a Busy Schedule. This post is part of a series sponsored by The National Milk Life Campaign’s Back-to-School Program however all opinions are my own. It can be nearly impossible to set aside time for the whole family to get out and do something together. Some days I’m running the big kids to commitments and my husband is home with the little boys or taking them in a different direction. We try to set aside at least one day each month that is just for family – no work, no homework, no sports, no friends, just family. We make plans to go someplace for the day even if it’s just getting out in the woods to hike and explore. When we stay home for family days, we find everyone gets distracted by the normal day to day stuff and is doing their own thing. When we get out together we connect with each other. This past weekend we headed to our favorite apple orchard and cider mill. We’ve been going to this same place every fall for as long as the big kids can remember. We have time in the car to talk and catch up and we spend the day outside doing things we all love. It doesn’t have to be an expensive day out together, just a day to focus on each other. This has been an important family rule in our house from the beginning. No matter how busy we are we try to make sure meals are eaten as a family at the dinner table. Sometimes schedule conflicts mean we can always sit down together or at the same time but we make sure that most meals are shared around the table. Eating together at the table as a family helps to establish life-long healthy habits, both regarding nutrition and lifestyle. It’s a time for us to talk about our day, about plans we’re making, problems we’re having, things we need to do, and so much more. It’s a way for us to connect with each other. It’s an opportunity for us to teach the kids that no matter how busy and crazy things are that we still make time for each other. When we enjoy healthy food and drink choices as a family we’re teaching the kids about good nutrition and making the right decisions for a healthy lifestyle. In our house, the dinner table isn’t just for dinner or meals. It’s where the kids do homework, where we create crafts together, where we have family game night. The dinner table is where after school snacks are enjoyed, family meetings are held, and lots of laughs are shared. We make time for crafts together, we make time for game night, and we encourage the kids to do homework together where we are around. Again, the time around the table is important for establishing life-long healthy habits. When we’re at the table we’re all close to one another, we can see each other and eye contact is easy. We’re there to answer questions or help with homework and the kids never have to feel like they are bothering us with a question because we’re right there with them. At our table communication comes easy, encouragement is plentiful, and love and laughter is a constant. Family time can come in little doses, squeezed in between commitments and time around the table is the perfect way to squeeze that quality time in. Never think that because you can’t spend a whole day together that you can’t work family time in. Little moments, like game night or crafts, can leave a big impact. These are just a few simple ways we enjoy quality family time even though we have a busy schedule. Quality family time is a key part of our healthy lifestyle. In mid-September, we joined the Milk Life Back-to-School campaign, a program designed to educate moms and others who care for kids about the powerful nutritional benefits of milk. 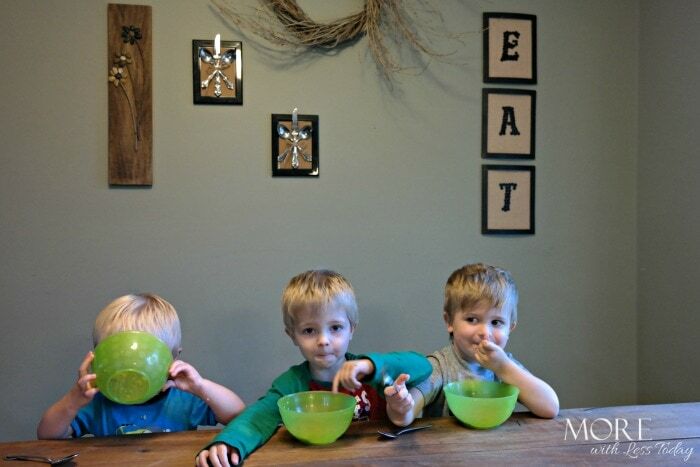 Last month, we shared tips that you might not know about milk and a day in the life of feeding my kids. With real milk I know I am giving our growing kids protein and nutrients needed to fuel their busy days. Dairy milk is a nutrient rich powerhouse. Real milk is just simple ingredients – milk, Vitamin D, and Vitamin A. Milk is also minimally processed and often locally delivered with the pasteurization process simple. It;s hard for kids to get important nutrients like calcium that they need to grow up strong, without milk in their diets. Whether it’s regular or organic, flavored or white, all varieties of real milk are safe, wholesome, and naturally nutrient rich. The best way I find to help keep a healthy life style for my family is meal prep! Planning meals ahead always helps. I try to provide a healthy lifestyle for my family by purchasing nutritious foods and going for daily walks.